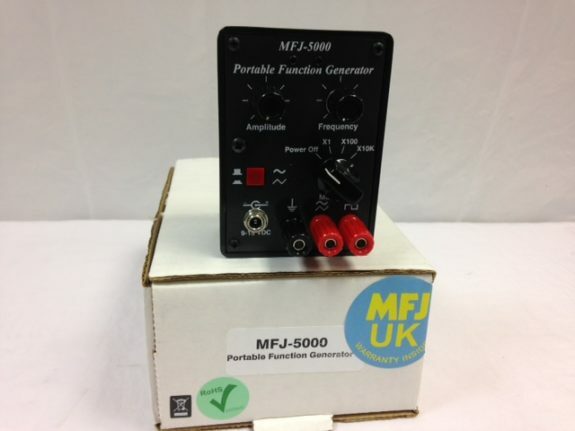 MFJ-5000 Portable Function Generator Used 12 Months Warranty. MFJ-5000 Portable Function Generator Used. This unique MFJ Portable Function generator is the only compact, battery-operated function generator designed for travel or bench use. MFJ-5000 travels easily and fits in the smallest tool box ready for instant use. Great for engineers, service and lab technicians and hobbyists. Based on an XR-2206 integrated circuit, it provides Square, Triangular, and Sine waves continuously from about 1 Hz to well over 150 KHz in three ranges. It also has a frequency range switch, external power jack and three 5-way binding posts for outputs. Built in a rugged, high impact cabinet. Measures a compact 0.75H x 0.75W x 1D inches. Uses 9 Volt battery. MFJ-5000 Amateur Radio Shops HAM Radio Dealer Supplier Retailer.